Who knows what evil lurks in the hearts of men? The Shadow knows. More specifically, the Face Shadow. Its tendrils creep under your skin and peel away the facade, leaving only blistered palms and the burning starkness of a noonday sun. See that Gatorade sign 363 feet away and another 22 feet up? 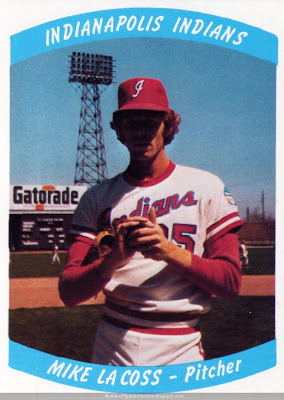 You think Mike LaCoss can't throw a gosh darn forkball right through the 'O'? Think again, chump. OK, this card has a mediocre photo, but check out the rest! They got a nickname, 4 years of stats, player bio, autograph, and some advice to youngsters all on one back. Compared to most oddball 1970s cards, the Indians design guys did efficient work. 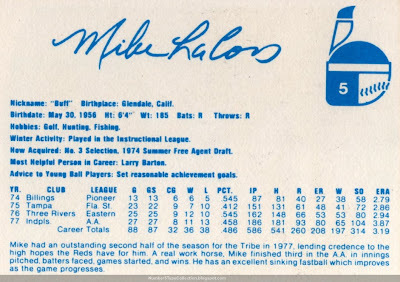 Value: I bought this Mike "Buff" LaCoss for $2.70 from MinorLeagueSingles.com. Dave (the owner) went the extra mile tracking down almost 30 obscure #5s and gets my hearty recommendation. 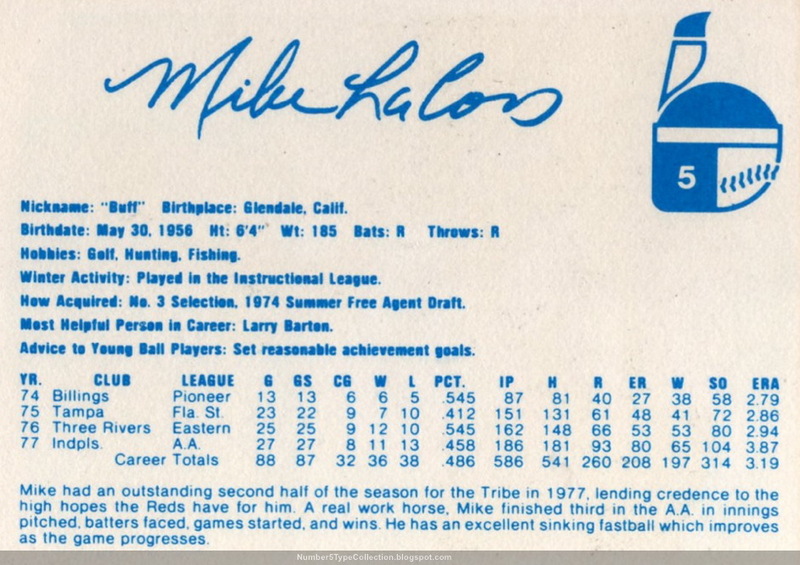 Fakes / reprints: Don't think we'll see a fake LaCoss anytime soon, thanks to the threat of forkball reprisals. How do you track visitors or readership? What locker room questions would you ask?